Stain Resist design Napkins 17" x 17". Pack o..
Stain Resist design Table Cloth 54" x 54". Wh..
Stain Resist design Table Cloth 54" x 72". Wh..
Stain Resist design Table Cloth 54" x 90". Wh..
Stain Resist design Table Cloth 54" x 72". 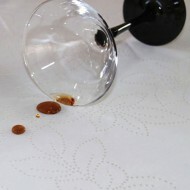 I..
Stain Resist design Table Cloth 70" round. Wh..